Tears flow daily around the corner and around the world as we encounter loved ones, friends, and strangers hurting in many ways, but through the compassionate love of the world, these hurts and pains can be positively changed, and anything is possible. 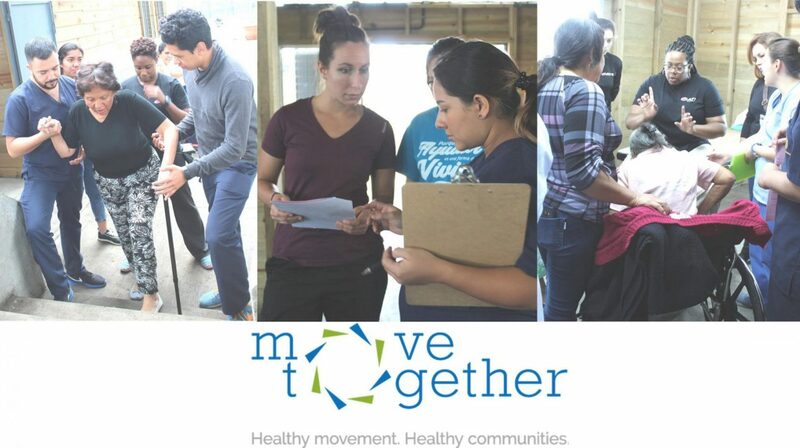 The global Move Together family collaborated in May 2018 to minimize the hurt by maximizing movement and thus maximizing life in the municipalities of San Pedro Sacatepéquez and Villa Nueva, Guatemala. In San Pedro Sacatepéquez, we assisted in the transformation of a 15-year old space into a functional, sustainable physiotherapy clinic in cooperation with a medical and dental clinic. A collaborative space built 15 years ago to be an interprofessional medical clinic but left lying dormant due to the lack of funds and bandwidth to fully functionalize the dream until now. When Dr. Rodrigo Buch became Mayor of San Pedro Sacatepéquez, he envisioned a plan to increase access to healthcare and operationalize this space, but still the need for funds to equip and clean up the grounds was looming. With funding to staff and sustain the interprofessional clinic, Mayor Buch reached out to the local and global community thus partnering with Move Together to stimulate equipping and beautifying the grounds of this dormant but functional space. 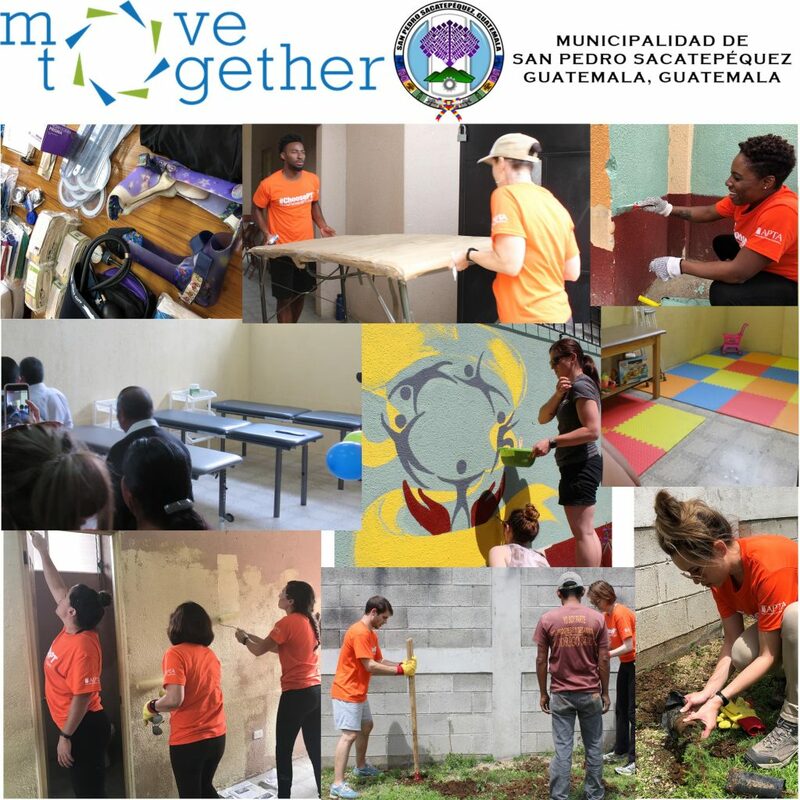 In May, the Move Together family of 24 members and three supporting organizations, ATI Global Reach, APTA, and Cardon Rehab, from the US, Brazil, and Peru came together with local Guatemalans in the painting, external groundwork, equipping, and operationalizing the space. The activation of the space brought to life a dormant building and brings new hope to local and neighboring communities whose hurts had gone unheard until now. Mayor Buch chose PT to be part of this interprofessional clinic because of his own experience suffering from back pain and having to travel 1.5 hours into Guatemala City to receive treatment a few times per week. He knew that many in San Pedro Sacatepéquez and neighboring communities could not travel to Guatemala City for treatment. Even if they could, there was significant loss of time and associated costs with the journey. In the municipality, people could receive medication, but this too was limited and not resolving the underlying cause of hurt. Therefore, Mayor Buch chose PT and chose to collaborate with Move Together and the Villa Nueva physiotherapy clinic to increase access to quality rehabilitation medicine in San Pedro Sacatepéquez. The beauty of this clinic is its multidimensionality and multidisciplinary nature. First, the multidisciplinary nature of medical, dental, and PT allows for cross-collaboration and diagnosis of patients, the reduction of pain medication, and the diminishing need for expensive surgeries. 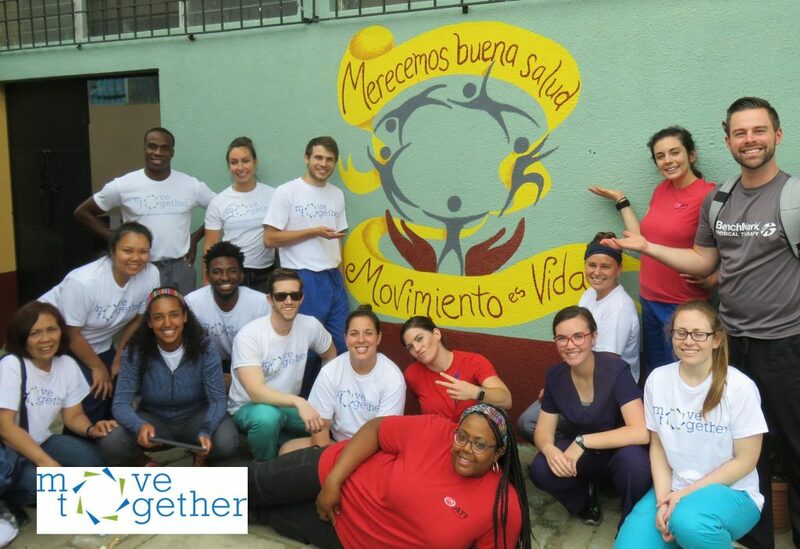 The clinic is multidimensional as it collaborates with the Villa Nueva Clinic, Move Together, and other supporting organizations. These interdisciplinary and organizational relationships provide increased opportunities for sharing, learning, and enhancing the healthcare on the ground and around the world. Thus transforming communities and lives and empowering clinicians and physicians exemplifying that anything is possible when we come together with our hands, hearts, and words. Empowering clinicians and advancing interdisciplinary and organizational relationships near and far makes for a stronger profession and a better world. Therefore our presence in Guatemala goes beyond sharing to collaboratively working together to grow and transform the profession and lives of the people. 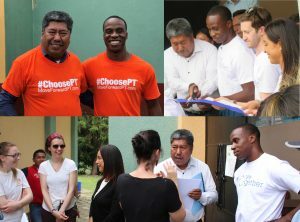 The US and Guatemalan PT professionals and students joined together for an intense day of developing comprehensive plans and educating families for 45 patients referred to the Villa Nueva clinic by physicians. The varying experiences and specialties of the family and clinicians gathered together to develop a comprehensive plan for clinical and home treatment provided an advanced quality of treatment to patients. The opportunity also advances the PT profession as every person present learns something new. A new perspective or a new idea in the mind of a PT or a patient opens the opportunity for another person’s life to be transformed by maximizing movement thus maximizing life and the access to quality healthcare. The entrance to the San Pedro Sacatepequez clinic welcomes patients, family members, clinicians, and more daily with the palpable expressions: Merecemos buena salud and Movimiento es Vida. (Everyone deserves good health and Movement is life.) We look forward to hearing, sharing, and supporting the continued efforts of the clinics in San Pedro Sacatepequez, Villa Nueva, Guatemala, and around the world as the Move Together mission and vision are empowered near and far. Thanks to Move Together family members, Tessa Diaz and Stephanie Irwin, for their beautiful mural design!